In determining a patient’s current health status, it is important to identify problem areas in the patient’s outcomes and consequently in the patient’s treatment. For this purpose, cyberREN supports the definition of quality indicators to be considered in the diagnostic/evaluation process, as well as to define patient specific targets for each quality indicator. 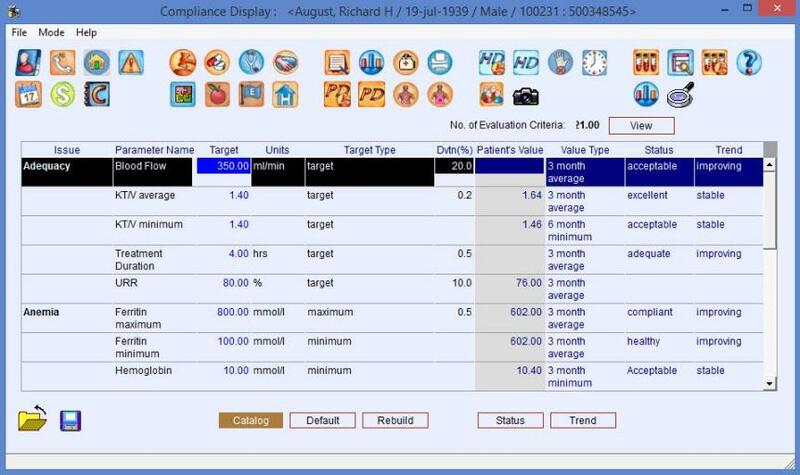 The QA Compliance display presents a set of CQI indicators used in a specific treatment modality, presented along with the outcomes for an individual patient. A comparison of targets and patient outcomes sheds light on an individual issue to be considered in developing a plan of care and determining a treatment for a patient. The QA Compliance display relieves the caregiver of searching through the medical record for key elements to determine whether the patient outcomes meet the standards of the organization. Based on information listed in the QA Compliance display, the user can make well informed decisions about required changes in the patient’s treatment schema.